Home » The Staff » Rebecca, A.B.O. 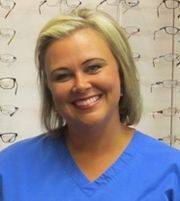 Rebecca is our optical manager. She is an ABO certified optician and lab technician. She has worked with TSO since 1998. Her years of experience and expertise have created a large following of patients. She has a special gift when it comes to selecting a frame or getting a new pair of glasses to fit just right.